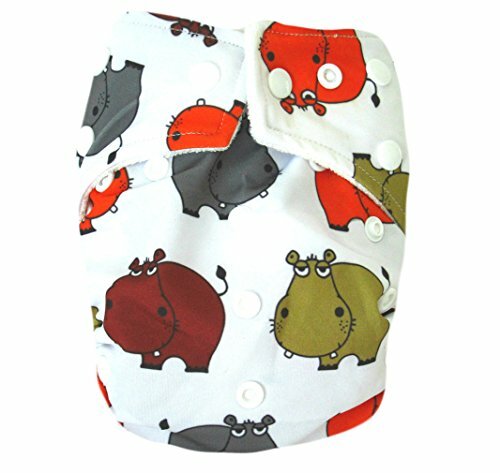 This Mom Label Organic Bamboo One Size Pocket Diaper consist of 2 parts: a waterproof outer shell + 2 large Grade A Organic bamboo inserts. The outer shell is made of high quality, durable and soft fabric. Laminated with the new and improved Thermoplastic Polyurethane (TPU), a composition specifically adapted to produce non-porous membranes exhibiting waterproof and water vapor transmissible. The result is a high performance, durable, excellent water-resistant, cut and tear resistant and soft diaper. The inner lining is made of Grade A 100% Organic Bamboo Fiber. The inserts are made of three layers of Grade A 100% Bamboo. Hypoallergenic- Bamboo’s organic and naturally smooth fiber properties are non-irritating to the skin, making it ideal for people with skin sensitivities or other allergies and dermatitis. Thermal regulating- Ensures that you are warm in the winter and cool in the summer. Bamboo’s excellent wicking properties makes it ideal for warm summer days. Absorbency- A cross section of bamboo fiber reveals various micro-holes, allowing the diapers to have superior absorption. Absorbs up to 60% than cotton. Breathable – The porous qualities of bamboo fiber gives great breathability and is extremely comfortable against baby skin. Anti-bacterial- Bamboo fabric contains a natural occurring anti-microbial agent that prevents bacteria from cultivating.